Bonded by blood and music, the singular efforts alone between Original Sin and Taxman span years of DJing, beat making, and bassline contriving. Considered innovators and dons of the upfront dancefloor scene, they’ve teamed up to create a creative new outlet: Planet Drumz. Serving as a resource for aspiring producers, Adam and Dominic Tindall stand poised to put their own creative stamp in this business of bass music. Planet Drumz offers fans direct access to exclusive releases, launching with a coveted USB stacked with sought after tracks. The endeavor aims to please, including an online production academy, sample packs, and hot merchandise. 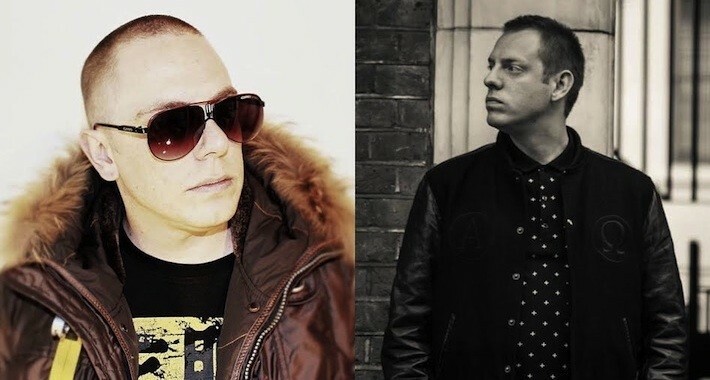 It seems after the majority of their careers spent holding the foundation of the legendary Playaz label, Adam and Dom push continue to evolve further cementing themselves as pillars of the drum & bass scene. With upcoming appearances at both Escape and Funktion this weekend, Bassush gets the lowdown on all things Planet Drumz, Original Sin’s forthcoming release on RAM Records, and Taxman’s new sample pack. We’re excited about your new Planet Drumz project. For the uninitiated, can you explain what it’s all about? Original Sin: Planet Drumz is hard to put a label on right now. We do everything from sample packs to snap backs. I think our biggest project, and the one we’re most proud of currently, is the Planet Drumz Academy. The Academy is launching online at the end of November and will be an online masterclass hosted by Taxman and myself. It will be an extremely detailed explanation and demonstration of everything that goes into making a big D&B track. There is periodic one-to-one support from Taxman and myself throughout the master class, which will run for six months. Taxman: It’s also a website Original Sin and I created to enable us basically do whatever we feel like doing. Our first project was our exclusive USB release, which went down really well. We’ve also been putting together our own sample packs, and we are just on the about to launch the aforementioned Planet Drumz Academy. We’re looking forward to taking people through an in-depth look at our production techniques that we have learned and mastered throughout the years. Beyond that, Planet Drumz is giving us the freedom to do whatever we feel like. You mentioned a USB release. What was included on them? Taxman: It was a mix of new and old unreleased music. It was music that, for some reason or another, wasn’t released, but every time people heard [the tracks], they asked about releasing it. We thought we would do a limited run, which are both now sold out. Taxman: Original Sin has released two sample packs so far, and I’ve literally just finished mine, which will be available to buy at the end of the month. It’s a mix of new and classic sounds that we are both known for, which has been made in our own studios using a mix of our digital and analogue equipment. It was time-consuming putting it all together, but I think the finished products speak for themselves. What is your role in the making of the sounds? Taxman: We basically made all the sounds on the packs, because that’s what people have asked for, and there’s also a lot of our classic processed drum sounds on there, too. A lot of the sounds have been made especially for the sample pack, and we’ve also been through our project folders and used some of our classic sounds. With different producers offering direct online tutoring in the bass realm, what can fans expect from the Planet Drumz Academy? Taxman: With our Academy, we will be taking you through tracks and showing you how they were put together, how certain sounds were made, and how we process and mix our drum tracks. No stone is left unturned and we intend to give people a full insight into the way we make our music. Everyone has their own style and technique of producing, engineering, and mixing music—this academy will show you how we do it. There are a lot of remixes popping up for the Original Sin Warp Speed remix competition. Do you have any tips for those looking to get their submission noticed? Original Sin: We’re going to be listening to a lot of versions of the same remix to judge this competition, so do what you can to stand out and really put your own stamp on it—and of course a great mix always helps! Fans can’t wait to hear your new work for RAM. When do you think we might get an audio preview? Original Sin: I believe first radio play of my new track “Lost,” featuring BB Diamond, should be happening mid-November, and the track will be released November 27. It’s been a long process but I’m really looking forward to the release. I want people to hear this side of my music and also know the Original Sin release hiatus is officially over. I’m currently working on a follow-up for RAM as well. Everyone knows you have a huge following in the states, especially California. What do you guys have in store for your back-to-back Escape and Funktion sets? We’re used to the solo sets! Taxman: I love playing in California. Some of my most memorable sets and locations are there! The crowd is always very responsive and full of energy for our sets. Original Sin and I will be playing an upfront set full of new tracks and we’re hyped to play back to back! In the spirit of Halloween, do you have any favorite scary movies? Original Sin: They’re not scary but I’m always up for watching a bunch of the SCREAM movies around Halloween. I’m more into sci-fi really! The new Blade Runner movie was great, wasn’t it?